I don't know how I didn't notice that Miss Peach can draw! 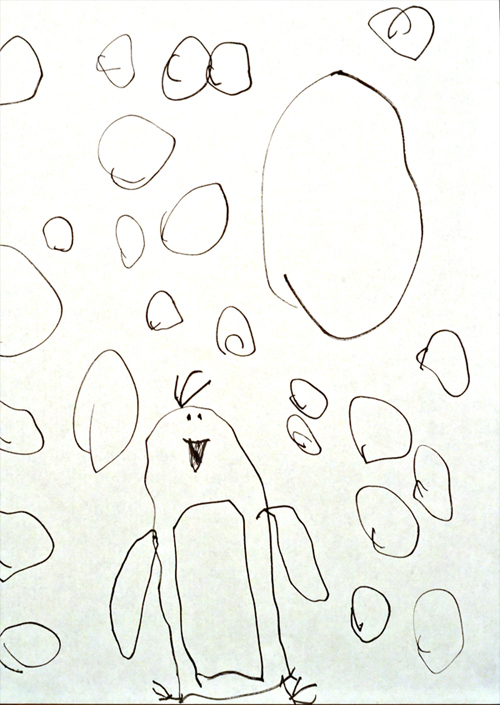 "Mommy, I drew this for The Little Man, and he doesn't think it looks like a penguin!" To which I said "Well not only is it a penguin...but it is a FABULOUS penguin!" She wiped the tears away from her face and replied "It's a penguin in a snow storm:)"
But the heart above the giant snowflake will heal the perfect little penguin! Does she draw a dozen pictures a day and expect you to save them all? Our girls do. They get upset when we suggest that one of their drawings isn't worth saving FOREVER! Love that penguin! She does take after mommy! That is an awesome penguin! How could Little Man not see it?